It’s hard to believe that it’s been 20 years. From having a basic idea about giving back in 1999 to becoming the world’s largest non-governmental funder of childhood cancer research. When this started, I didn’t even have kids of my own – and I have often been asked why I thought about helping kids fight cancer. There are two reasons childhood cancer has always been on my mind. The first involves a boy named Lee who lived around the corner from me growing up in Rockaway, NY, on 127th street by the yacht club. I was young so I don’t even recall if I have his name correct, but I do remember he was a cool kid who liked collecting bugs and was always hanging out with my older brother. And then he wasn’t around anymore. That was the first time I had heard the word “cancer.” This great kid had died from it and just disappeared from our lives. It happened very quickly in the late 1960s or early 1970s – the fact that a kid could die stuck in my consciousness. The next time childhood cancer entered my world, I was a student at St. Agnes Cathedral High School in Rockville Centre, NY. Another student there, John Zarcone, died of cancer when I was a freshman or sophomore. We were not friends per say, but he was a fellow student and athlete and was always nice to me. His death hit me hard because I finally understood what cancer was and, sadly, how permanent death was. At that age, you tend to feel invincible. And yet this thing called cancer killed John Zarcone. Decades later, John’s death has never left me. His insistence that we come up with something brought Lee “the bug kid” from Rockaway and John Zarcone flowing back out of my subconscious to the front of my mind. We would give back by helping kids with cancer. As an adult, you’re more aware of the side effects of cancer treatments, and losing hair was the one thing people notice the most. So, I asked my friends to shave their heads in solidarity with children who lose their hair during cancer treatment. Luckily, all the revelers that night and roughly 20 other folks in the reinsurance industry were willing to take the first shave at our St. Patrick’s Day party, held March 17, 2000, at Jim Brady’s Pub in Manhattan. And the rest is history. People often ask me why I’ve stayed involved in this mission for 20 years. That answer is simple but somewhat painful. Once you meet the families of children battling cancer, or the families that now have angels because of cancer, and the young warriors themselves, you can never really just walk away. 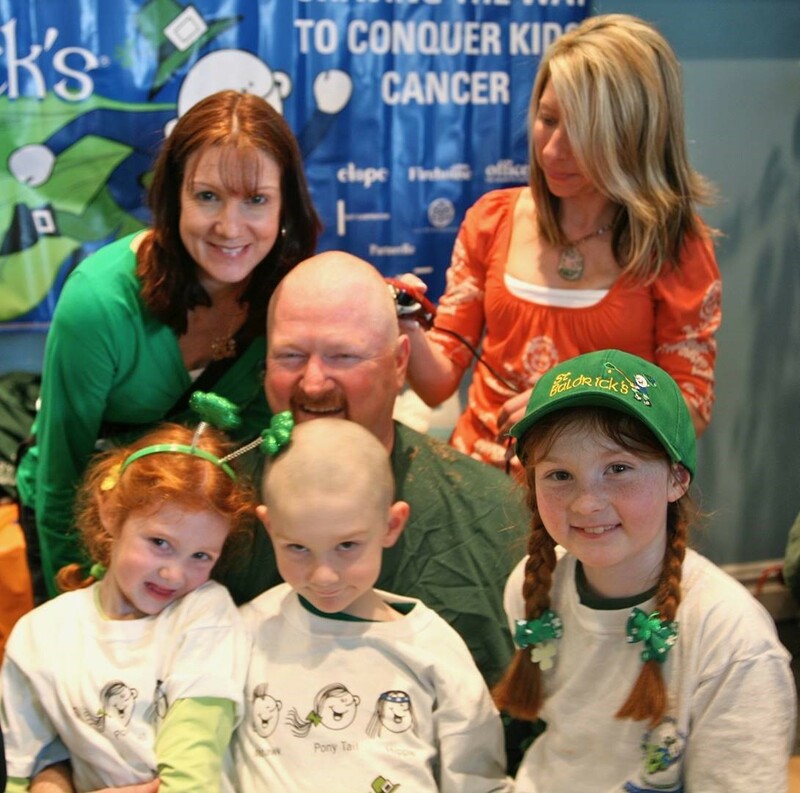 The Bender family at the Rockville Centre St. Baldrick’s head-shaving event in 2009. Today, all of John’s children are involved with the Foundation. My wife Alanna and I did not have kids in 1999, but now we’re blessed to have three heathy children. My son was born a preemie and ended up in the PICU (Pediatric Intensive Care Unit). There was a toddler there at the same time who passed away from cancer. It was tough to watch her family members come in to say goodbye. That further drove my desire to find a cure. As I grow older, I now have several friends whose kids have fought cancer and survived. I think often of Dougie, Nick, Kendall, Molly, Brent, Greta, Joey, and many others who St. Baldrick’s helped in their battle with this horrendous beast called cancer. Sadly, I think more of Jordyn, Keaton, Jen, Mikey, Mary, Kimi, and so many more that we have not been able to save. They drive my will to stay in the fight and push harder to help steer the engine that is St. Baldrick’s and one day fund the research that will find a cure for all childhood cancers. My family is the other driving force keeping me in the fight. My three teenagers – Shannon, Brady, and Casey – have grown up immersed in St. Baldrick’s. They have known local kids who battled cancer. They’ve seen the toll that both the disease and the treatments have on these young warriors. Shannon has chopped her hair off multiple times and raised thousands of dollars for research. Along with my wife, Alanna, and her co-organizers, Dan Schaefer and John LaCava, along with dozens of amazing volunteers, Shannon has helped organize the huge St. Baldrick’s event in Rockville Centre (RVC) that has raised millions of dollars for childhood cancer research. Shannon also started the first-ever St. Baldrick’s club in her high school. Her club has raised money for research, raised awareness of the need for more young people to think about careers in childhood cancer research and she’s advocated for increased childhood cancer research funding. The club also spreads cheer during the holidays by running gift drives for teenagers at Cohen Children’s Medical Center in New York City. Most impressively, Shannon interned last summer in a pediatric oncology lab, acquiring in-depth scientific knowledge of childhood cancers. 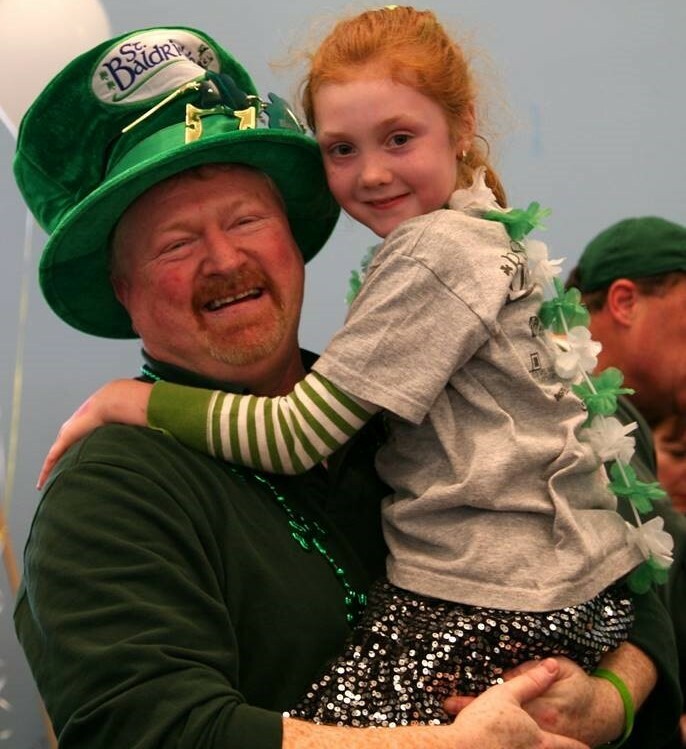 John with his daughter, who is now a teenager and heavily involved in St. Baldrick’s fundraising efforts. Brady and Casey have also been heavily involved in the foundation. Both work year-long to help organize the RVC event and both help raise thousands of dollars by sacrificing their hair each year. Both are members of the St. Baldrick’s club and continue to do everything they can to fund a cure. Last but not least, Alanna has been tireless in her efforts to find a cure. Whether it’s running a huge annual community fundraiser, throwing gatherings with requests for gifts for kids fighting cancer, helping other organizers start events, or attending fundraisers on Long Island, she has been there from the beginning and continues to be a driving force in the success of St. Baldrick’s. 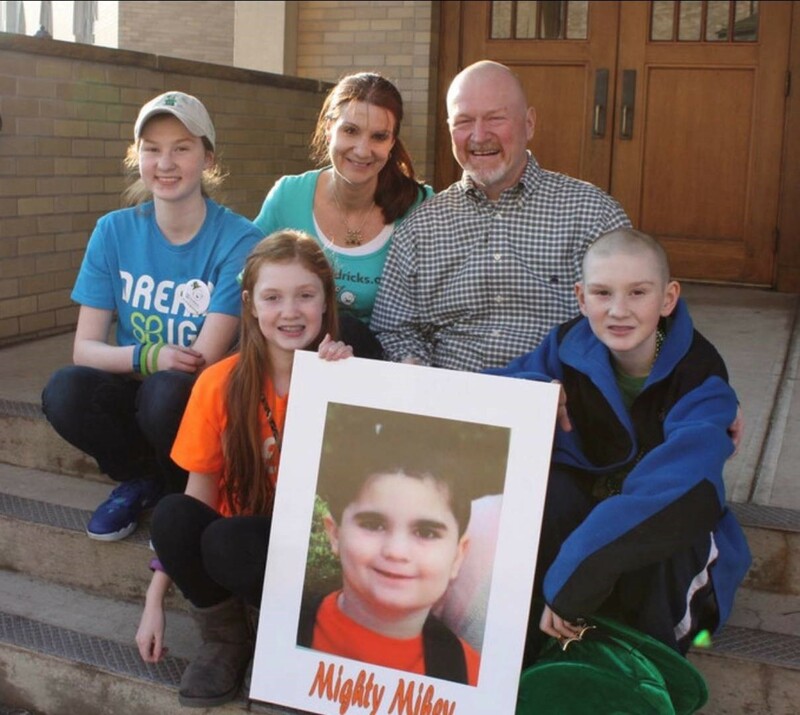 St. Baldrick’s has become a family mission for the Bender family. We believe in leading by example, so when we ask others to organize an event, raise money, or shave their heads, we know we have to do everything we ask others to do. So, this year will be my 22nd dance with the clippers in 20 years of shaving heads and raising funds for childhood cancer research. I continue to do this because it is our family mission to find a cure. I continue to do this because I am proud of all the efforts my family has made to find a cure. But most importantly, I continue to do this because of the kids and their families we have had the honor of meeting along the way. We owe it to them to find a cure so that one day no child or family ever has to fear the beast known as cancer again. Until that day comes, we plan to keep leading the charge alongside the St. Baldrick’s Foundation.